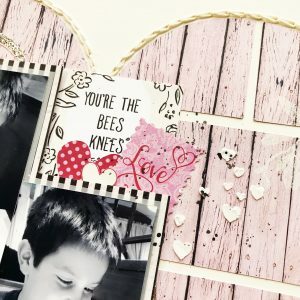 Hi everyone, we’ve got some Valentine’s Day Scrapbook layout inspiration for you below! 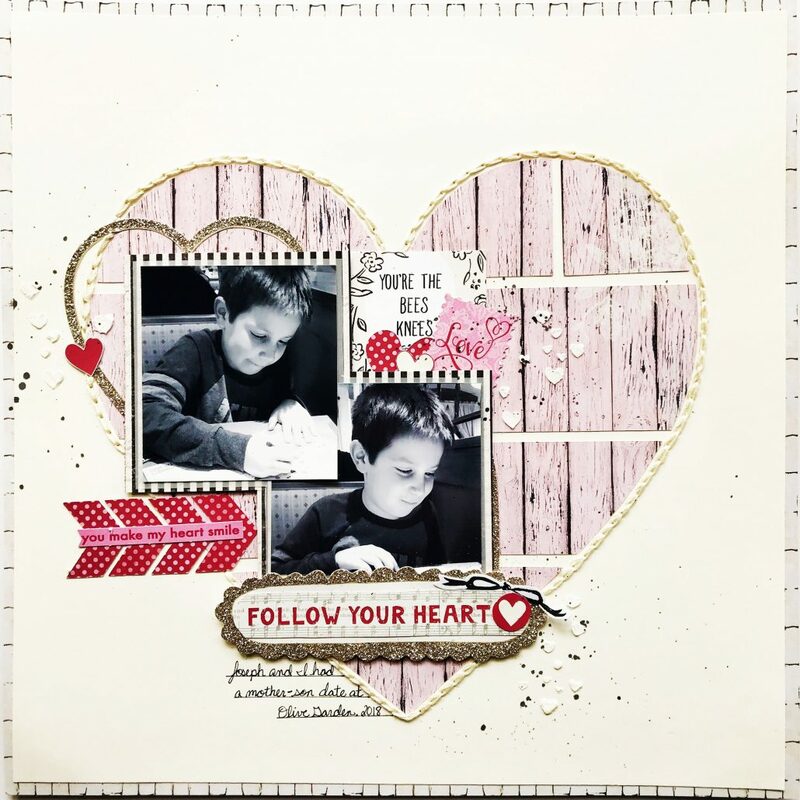 Design Team member and Scrapbook Veteran Laura Alberts created these beautiful layouts with our February kit scrapbook paper. 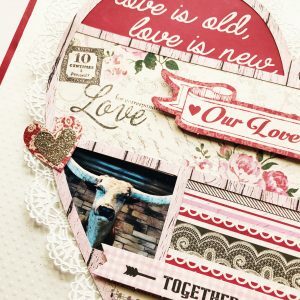 She used a free cut file made by Katie Kinnamon to cut the pink wood grain patterned paper and used all three parts of it on three separate layouts. 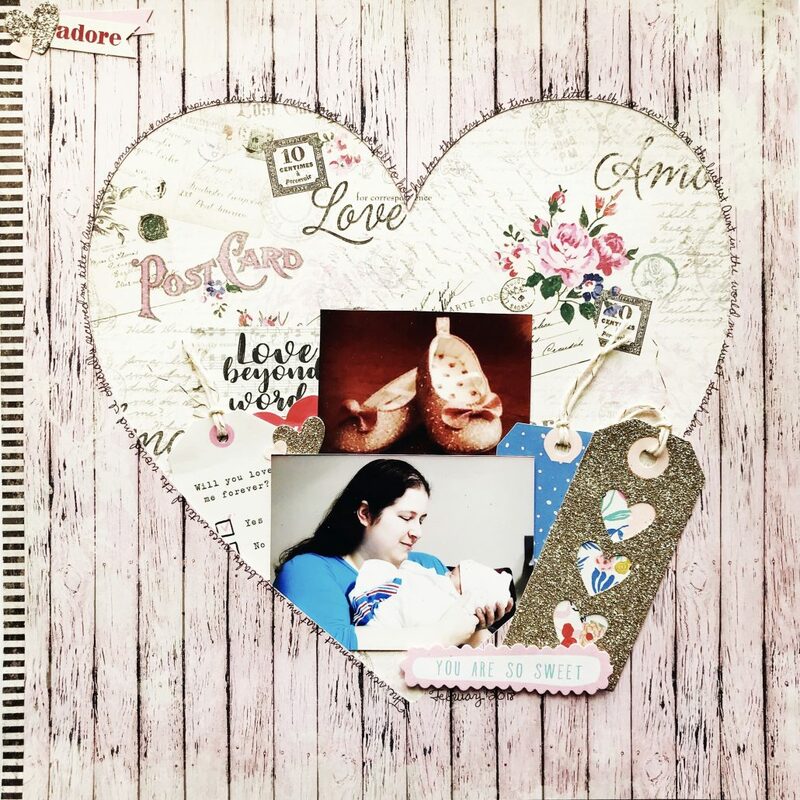 For the first scrapbook layout, Laura used the outline of the heart and backed each opening with different patterned papers. Then, she wrapped lace around the outside of the heart and added a few clusters of embellishments. Her titles were placed on adhesive foam to add dimension and interest. This was the perfect way to showcase two smaller photos and a sweet love story! 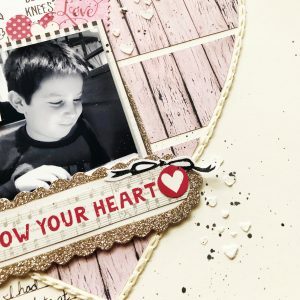 On the second scrapbook layout, Laura used the center pieces left behind by the outline and re-created the heart shape. Adding hand-stitching for a border around the puzzle gives it a complete shape. 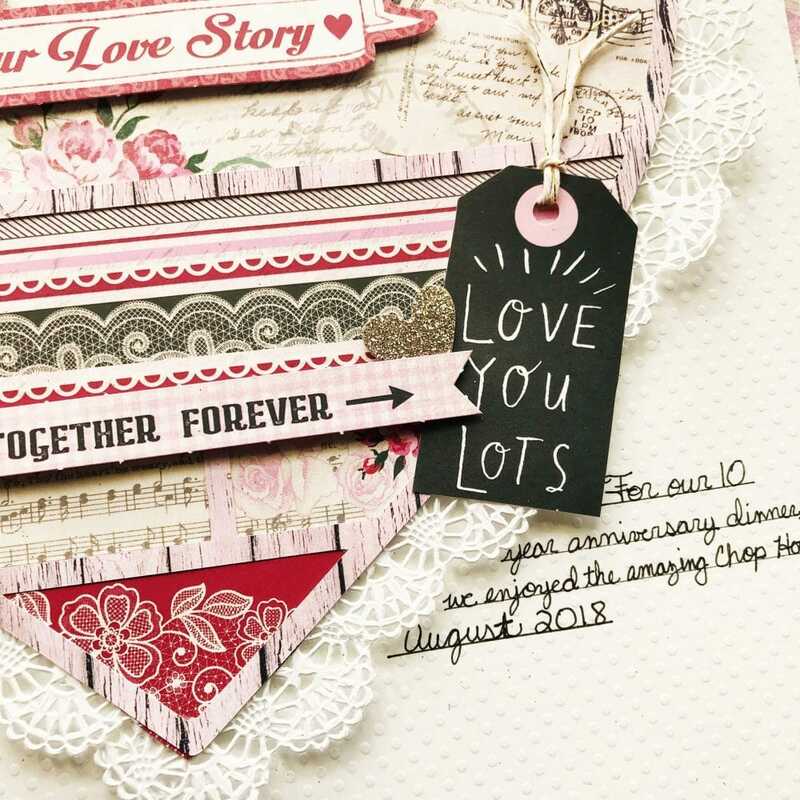 After backing her photos with vellum and a striking black stripe patterned paper, she placed them on adhesive foam to allow her to tuck in embellishments. The smaller white hearts were created from smoothing modeling paste through a stencil. For a final touch, she splattered black watercolor paint around each of the clusters. 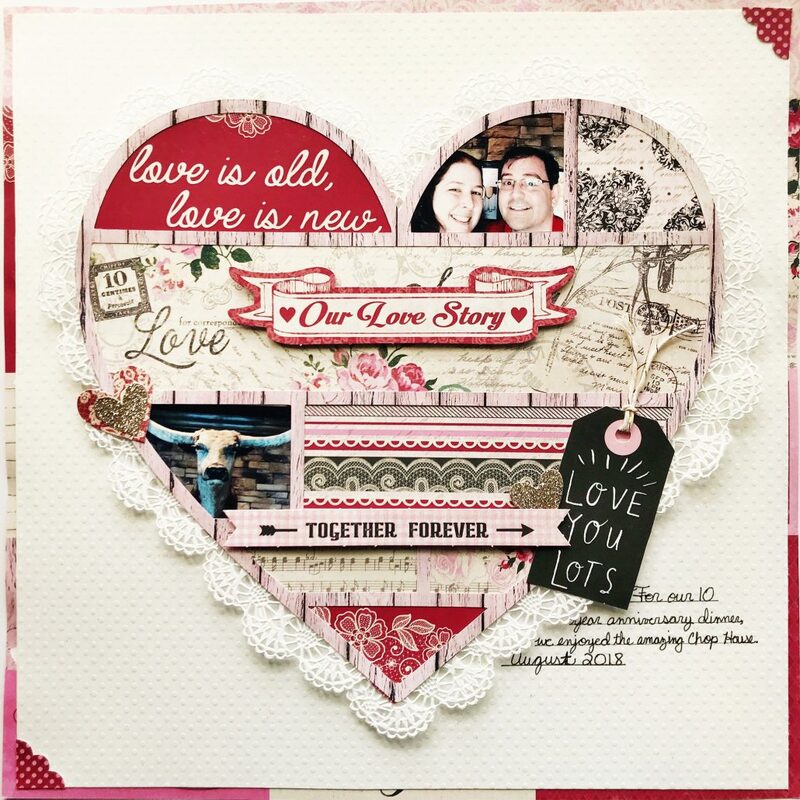 On scrapbook layout three, Laura used the negative left behind of the heart shape and backed it with this stunning postal patterned paper from the February Kit and tucked her photos and a few embellishments into the bottom. 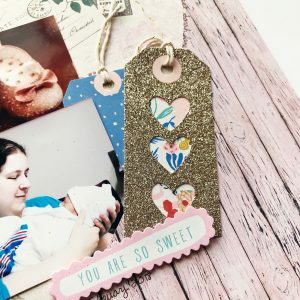 She backed the gold glitter tag with a floral tag from the upgraded embellishments and added adhesive foam under her title. She wrapped her journaling around the outside to create a defined border to the heart shape. A slim piece of that black striped patterned paper down the side adds a striking finishing detail. 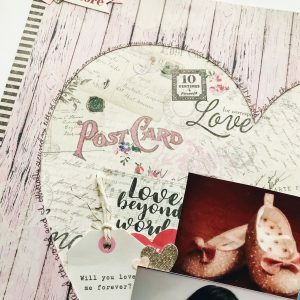 We hope this layout has given you some great ideas for making your own scrapbooking layouts! 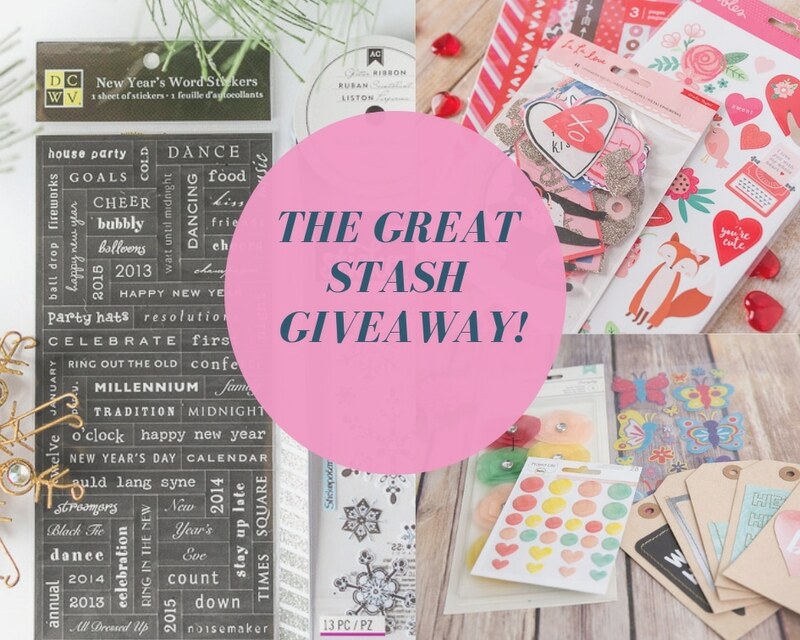 If you haven’t already, it’s not too late to sign up for our monthly subscription and get in on this AWESOME February Kit (only available until the end of the month). Just click on the button below to get yours today!